Faced with the challenge of living off their assets for 30-plus years after their working lives are over, it is not surprising that for most people around the world, retirement security is a significant, if not the most significant, financial goal. Retirement security is also an important international issue because of aging populations, shrinking or minimal growth in working-age populations, and public pensions that are either underfunded or under stress. Around the world, defined contribution plans are replacing defined benefit plans, and thus employers are clearly placing the funding — as well as the financial and investment risks — squarely on their employees. Although the amounts differ in each country, retirement income typically comes from three sources: government programs, employer-supported pensions, and individuals’ savings. Because each component is involved in providing retirement benefits, we asked CFA Institute Financial NewsBrief readers who should bear the primary responsibility for a well-funded retirement. Of the 814 who responded to our poll, an overwhelming majority (roughly 82%) believe that individual retirement investors have the ultimate responsibility for financing their own retirement liability. 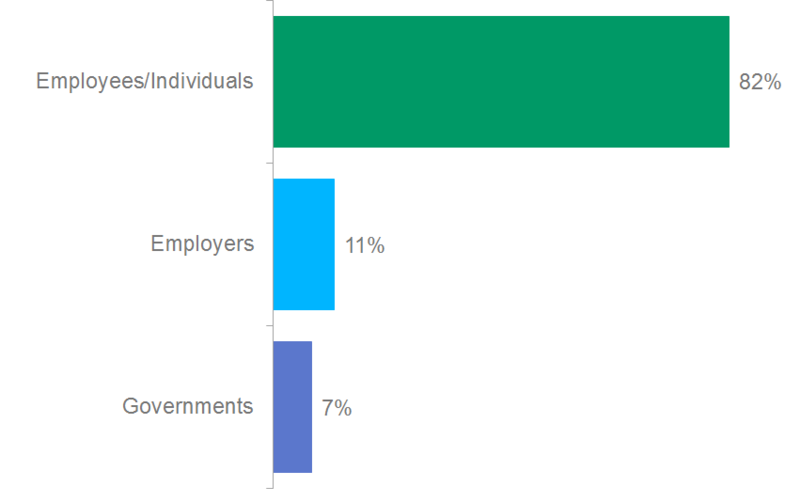 The remaining 18% of respondents were split between employers (11%) and governments (7%). Who should bear the primary responsibility for a well-funded retirement?